After meeting up with Richie & Keith in January, our calender filled up with all kinds of cool instameets! 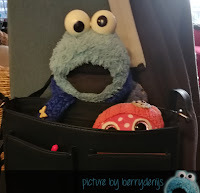 On February 12 lil Coral and me went to Amsterdam to meet our sweet German friends Jaques, Jaqueline, Di-Lu, Peter and Ben – and their humom ofcourse! Coral was sooooo excited to see Di-Lu again! They are family you know. Coral was a gift from Jaques and Jaqueline to our family a few years ago. And me love her to pieces. But she really wanted to catch up with her family. 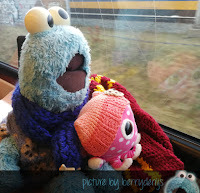 After an exciting traintrip to Amsterdam we met our dear friends at the train station. First we had lunch. Me got real spoiled with nommy cookies in a heart shaped tin, some foil balloons and socks with me face on it! Well… the socks were for Berry. O and we got a little new fishee friend to join our family. 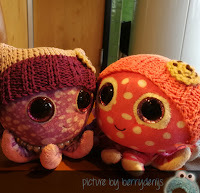 We made Di-Lu a hat to match Corals Cat-Hat. 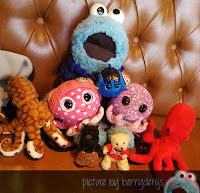 Also we gave some cookiepins to the rest of the family. Coral and Di-Lu had loads to giggle about! They were soooo happy! After lunch we went shopping! Me love shopping. It always lots of fun. At HEMA Berry bought me some hairbands, one of them made me really fit in with me eight legged friends. Hihi. Can you see it in the picture? 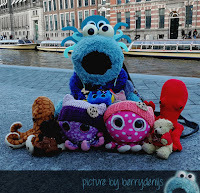 We also went for coffee at Rembrandtplein and we did a Canal side photoshoot! It was so much fun! The family was soooo sweet. Me sure we could have talked for ages and ages! Also we could have cuddles for ages hihi. 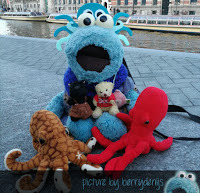 Me got all entangled with all those octopusarms. 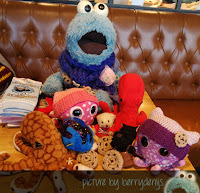 Also thanks to Jaques, Jaqueline and the family me got to adopt a lil Cookie Monster brother from Germany! 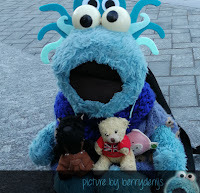 Me, Coral, lil Cookie and our fishee no can wait to meet the family again! Me sure we will soon.